When former wallflower Chase Maxfield returns to school in the fall as a hunky high schooler, he temporarily siphons attention away from golden boy Troy Barrett. Troy's older brother Jack is oddly unsettled by Chase's too-good-to-be-true physical transformation and befriends him. But as he enters the Barrett's inner circle, it becomes clear that there's more to Chase's miraculous evolution than he's willing to tell. Jack's uneasiness mounts as both family and friends report sightings of his father's dangerous alter ego. Then when his grandmother is mysteriously poisoned, his brother turns up missing, and his girlfriend appears overly interested in a new guy at school, Jack's confidence is shaken to the core. And though a dead man can't live, Mr. Eden seems to be reaching from beyond the grave with a singular agenda-destroying Jack Barrett from the inside out. Steven L. Layne continues the thrilling tradition of intrigue and suspense established in This Side of Paradise in the second novel of his Paradise Series-a book destined to be another crowd-pleaser. Born into a world that has eliminated every physical and historical trace of racial identity, Dirk and his friends have spent their entire lives in hiding. Now, they must make a dangerous journey into the past with the hope of restoring the world's natural timeline and dissolving their engineered society. But someone is waiting for them - hiding in the folds of history. Someone powerful. Someone dangerous. Someone . . . with a lot to lose. In his second offering to young adults, Steven L. Layne weaves another cautionary page-turner, this time illuminating the potent issues of race, loyalty, and leadership. 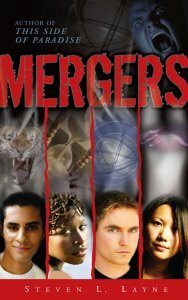 A riveting sci-fi plot and supernatural characters, struggling with all-too-human failings, will leave readers satisfied . . . and mindful of every individual's potential to change the world forever. Download a character tracker that will help you meet the characters. Something wicked this way comes; in this case, it's high schooler Jack Barrett's father, whose inherent drive for perfection has spiraled into a raging obsession ever since he began working for the mysterious Eden Corporation. When his father forcibly relocates the family to Paradise, a village that is literally owned by Eden's enigmatic CEO, Jack uncovers a sinister plot that threatens the lives of everyone he loves. Delving even further into the secrets of the village, he soon learns just how high the price for perfection can be . . . and to what lengths some people are willing to go to obtain it. 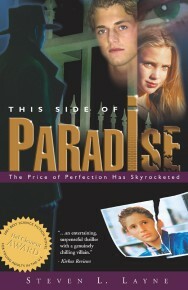 View the original cover for This Side of Paradise.